Just one the reasons why I love Artscow.com is that they always give free shipping or something free fee on some personalized items. Their quality is great and also their prices so I'm always ordering from them. 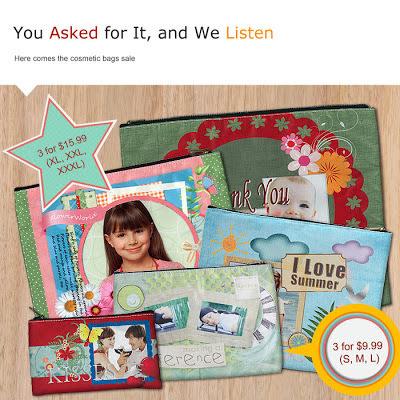 Just saw another promo from my inbox and it's Personalized Cosmetic Bags from 3 for $9.99 with Free Shipping! I always order cosmetic bags for my personal use and as gifts to friends and relatives. If you have an account at artscow now, add this code to your acct.